Governor Andrew Cuomo’s top health and environmental administrators invited members of five environmental groups to Albany recently to discuss the state’s developing policy on fracking. In contrast to a raucous demonstration by grass roots groups a day prior, the meeting on August 28 at the state capitol between heads of state and members of the country’s most influential environmental groups was held quietly and privately, minus media or press statements. A delegation representing the Sierra Club, Environmental Advocates, the National Resources Defense Council, the Environmental Defense Fund, and Riverkeepers met with DEC Commissioner Joseph Martens and Department of Health Commissioner Nirav R. Shah, and their aides. There was no formal agenda, according to those who attended the meeting. Rather, the commissioners were seeking the groups’ input on health considerations in the state’s regulatory overhaul on which the future of shale gas development in New York is pending. For those wondering about the status of shale gas development in New York, the meeting is the latest sign that the Cuomo administration is not yet ready to finalize its policy, despite reports to the contrary in the mainstream press. Members of the groups told Shah and Martens that the most recent draft of the state’s policy – the Supplemental Generic Environmental Impact Statement – falls short of adequately addressing public health considerations that should be taken into account with full-scale gas development. While the SGEIS details economic gains that communities can expect from shale gas development, critics feel it has not delved far enough into liabilities – many of them related to public health –that a gas drilling region can expect over time. In addition to environmental groups, a diverse collection of mainstream medical and health agencies are seeking the continuation of New York’s moratorium on high volume hydraulic fracturing until both impacts of health and environment can be better documented. The groups include New York State Association of County Health Officials, the American Academy of Pediatrics, the New York State Nurses Association, and the Medical Society of the State of New York. The simple fact that the environmental delegation was summoned to meet with the commissioners of the state’s health and environmental agencies is another sign of the governor’s ambivalence (discussed in a previous post) amid growing pressure on the administration. Grass roots groups have been protesting routinely in the halls of the Capitol, and a bevy of protestors have also flanked Cuomo during his public appearances in recent months, including a visit to the state fair on Labor Day, and an event in August called a Yogurt Summit to promote upstate dairy interests. Pro drilling groups have also been active, but not as visibly or as routinely as the opposition. More about that in a bit. Unlike the grass roots groups, which are seeking a ban, the mainstream environmental interests are generally pushing for a moratorium to allow time to construct a more comprehensive regulatory framework to handle fracking – the controversial process to extract gas from bedrock which has enabled shale gas development. Groups such as the Sierra Club, NRDC, and EDF have met with environmental regulators in briefings about specific policy points, including proposals to mandate water monitoring wells at each gas well site, and to outlaw gas well completion prior to pipeline construction. It’s worth noting here that some drillers have already slowed their rate of expansion in Pennsylvania amid a market glut and storage limitations, and that requirements along these lines would discourage companies to aggressively expand operations into New York without a significant rise in demand and corresponding prices. At the August 28th meeting in Albany, the delegation of environmental groups asked for an independently conducted health review of shale gas development along the lines of what was proposed by the association of county health officials. Although details were not discussed, it could potentially take into account chemical exposure risks from air and water emissions, industrial accidents, community stresses related to noise, traffic, housing, and population changes, as well as considering the resources necessary to manage them. The commissioners seemed receptive to the ideas, according to participants. While administrators may be willing to beef up their review of health consequences of shale gas development, it’s unclear what form the review would take. A formally sanctioned review – called a Health Impact Assessment – would require a preliminary plan to outline both the scope of the initiative and the resources to pay for it. The multi-step process would be open to hearings and public review that could add years to the overall review process. The administration could also work on a less formal plan to addresses health concerns with existing tools and resources and tack them on to the SGEIS, a document that already exceeds 1,500 pages. Regardless, the simple fact that a health review is on the table at this point suggests a final decision of fracking in New York is not imminent. Other factors loom. The Democratic controlled Assembly has already passed a bill legislating a health impact assessment as part of the state’s review, and in the absence of considerable and unexpected change in the Assembly composition this November, it will likely have the votes to do so again next session. The bill went no where in the Senate, which is controlled by Republican’s by a thin margin. But Republican control of the Senate is more vulnerable than the Democrats’ control of the Assembly, and Cuomo might be anticipating various permutations of how the issue could play out in the next Legislature. Despite all of the positive news about the potential release of the final SGEIS, we have been advised by credible sources that the Governor has been asked to delay the release of the SGEIS until after the November elections. Signs of a delay also were reported by those in the anti-fracking camp. “It seems to be on a slower track with a willingness to look at new issues,” said Rob Moore, executive director of Environmental Advocates, summing up a view that I heard from stakeholders involved with recent talks with the DEC. Some municipalities, including the Town of Binghamton, have passed resolutions favoring drilling, while others, such as the City of Binghamton, have passed resolutions opposing it. The issue playing out in local communities is legally known as Home Rule. Cuomo has said that when gas drilling begins, his administration would begin permitting in areas that want it and not in areas that oppose it; but the approach is rife with legal implications – about where and how the state can intervene to allow mineral extraction in some areas and not others -- that go well beyond the politics of the matter. While proponents may be discouraged by Cuomo’s lack of commitment to shale gas development, they can take heart in President Obama’s bullish attitude on natural gas development nationally, expressed most recently during the president’s Convention speech. But in the short term, at least, there are market factors at work against the industry that transcend politics. A glut has driven prices down and dampened the pace of the rush that was going full bore in 2008, when gas companies were offering between $3,000 and $5,000 dollars an acre to lease land up front, plus royalties of 15 percent of more. Now the value of the mineral resources has fallen, raising questions whether shale gas extraction in New York is even economically viable. There is important and controversial work ongoing to develop infrastructure, however, including converting salt mines on the west side of Seneca Lake into a facility to warehouse surplus gas coming on line in Pennsylvania and Ohio until prices rise. In the meantime, Obama’s speech suggests the federal government will do what it can to support expanding markets for domestic natural gas, which would drive up prices and incentives to drill. Expect nothing less from a Mitt Romney administration, and probably much more in the way of deregulating the industry to lower the cost of extraction. "The simple fact that the environmental delegation was summoned to meet with the commissioners of the state’s health and environmental agencies is another sign of the governor’s ambivalence (discussed in a previous post) amid growing pressure on the administration." The phrase "the environmental delegation" jumped out at me. I realize it's a group of people or interest groups inside or outside government. I initially read it (yes I first skimmed the post) as a pejorative comment on the state of environmental protection. Meaning that environmental concerns are delegated to others to deal with not NYDEC. I believe this could be the root of the problem. Cuomo doesn't seem to trust the NYDEC. So NYS is stuck in a scrum. Environmental agencies were established principally for environmental and human health protection. Not commerce. Aren't there other governmental agencies to help private sector with commerce and industry promotion in NYS for Cuomo to consult? David. Thanks for your perspective as an academician. Have any knowledgeable insiders revealed anything that goes beyond speculation? Longer answer: I think the big picture with all the moving parts goes beyond the revelations of any particular insider. So without being able to read Cuomo’s undecided mind on the issue, we are left with speculation. But it’s not too hard to connect the following dots. Why a meeting at this juncture? I think we’re seeing the interaction of two primary forces: It’s taken years for the public health community to study and identify issues necessary to lay the groundwork for a heath study, and to mobilize the political forces – through environmental organizations and agencies -- necessary to leverage this into action. Meanwhile, we have seen the gas market decline steadily. Essentially, the value of the mineral resources under New York have dropped precipitously since this all began in 2008. If the price of gas remained high and there were large sums of money on the table in New York, Cuomo would have been forced to take action earlier. As it is, he can sit back and watch the political contests on local and national fronts and factor the outcome into a longer-term strategy. The soft markets give him the luxury of time. Regarding your final question -- what's my take on Cuomo's role in this vis a vis the DEC and Commissioner Martens? – I believe Martens and health commissioner Shah have no incentive to rush this (as their respective agencies have nothing to gain by rushing), unless there is some pushing from their boss, which is absent at the moment for above reasons. Tom--one other possible factor in play is the questionable reliability of gas industry estimates of the amount of extractable gas in the Marcellus. For a while we were reading about figures of 500 Tcf or more, but then the USGS and EIA came out with figures that were more like 100 Tcf (if I remember correctly the USGS figure was around 80 Tcf and the EIA came up with a figure around 150 Tcf). A recent report from the USGS says that the median estimated ultimate recovery figure for Marcellus wells in PA is around 1.1 Bcf; industry was suggesting that was more like 4 Bcf. So I think the economic value of the shale gas in NY is a real question right now, not only because current gas prices are low, but because it is unclear how much gas could be extracted from NY's Marcellus Shale. Perhaps even at higher gas prices, the revenue generated would not justify the environmental and economic costs of drilling. The most recent post covers the current status of shale gas development. The original source cited in the post is in German but you can translate with Google. In short, I believe other states and countries are waiting on New York for a decision. And Oil and Gas is doing a push for more and bigger plays local and elsewhere. Its defense could with other governments would be: "Hey, New York thinks its safe. And you know how persnickety those New Yorkers are. So back off with the environmental protection concerns." Yes, I think that other places do have their eyes on NY. And all of them should take note that no one is talking about drilling/fracking in the NYC watershed. Mary, your reply to my reply to your comment kind of befuddles me. If I'm relaying old news, much apologies. Sorry for the befuddlement. What I was saying (or trying to say) is that NY evidently thinks that fracking inside the NYC watershed would not be safe--fracking in the watershed no longer seems to even be under consideration. If it's not safe to frack the watershed then it's certainly not safe to frack next to homes and water wells. So if NY greenlights fracking in limited areas (like my area in Broome County, for example) but still forbids fracking in the NYC watershed, then I hope that other states and nations will not interpret NY's decision as an indication of fracking's safety. At this point, there are so many red flags about fracking that any decisions to proceed with fracking will be made for political reasons, not for scientific or ethical reasons. Mary, now I get it. In short, your assessment of the situation is correct. The science is being overwhelmed by politics and the hyper-enthusiasm for upfront land deals and back end gas and gas liquids sales. I quickly read the draft supplemental generic environmental impact statement (dSGEIS). There are obvious no drill areas like the NYC water supply watershed and Syracuse area. However, I couldn't with full understanding determine how the Southern Tier would be defined as 1) no drill primary aquifer areas, 2) maybe drill areas or 3) if characterization demonstrates otherwise, OK to drill areas. The language seems to be written for later interpretation (i.e. a bit drafty and weaselly). Anyway, a delayed rambling response by me. Good point. In terms of supply, there are other wildcard factors also worth noting. 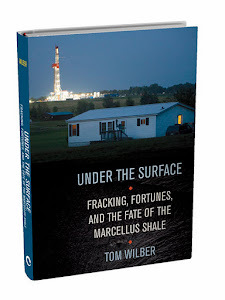 The unexplored Utica shale and other formations in New York are variables in the calculus of long term viability. We don't know a lot about them, although they do provide added incentive for exploration by speculators.